As a small business owner, it’s important to take steps to protect both your personal and business assets, particularly from major lawsuits that could stem from customers or employees getting injured or just general increases in regulation. There are different forms of asset protection, including incorporating your business, establishing domestic/offshore trusts, equity stripping, transferring assets out of your name, and structuring assets based on state-protected exemptions from creditors. 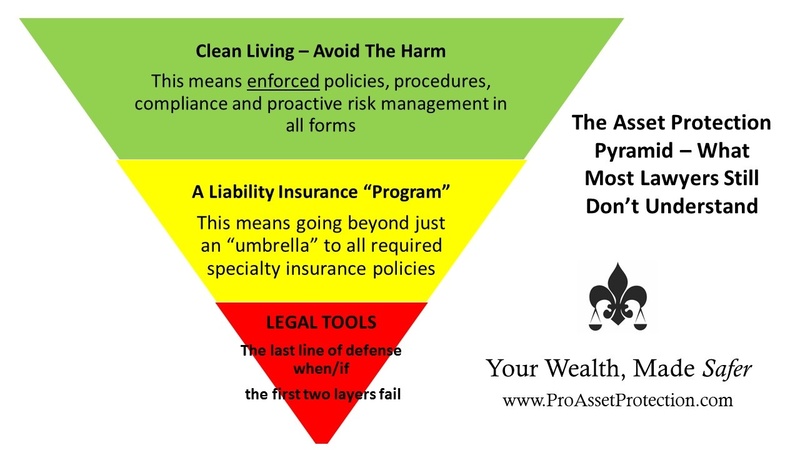 But one major form of asset protection is to properly insure yourself, both personally and commercially. Take a look at the types of personal and commercial insurance policies that are essential to you as a small business owner. Here are several types of insurance policies—many are standard and you’re probably familiar with them. And there are a few surprising ones, but they might make sense depending on your circumstances. Term Life Insurance: Pays out a specified amount to the insured’s beneficiaries at death. Car Insurance: Covers your personal or company car against accidents and thefts. Home/Renter’s Insurance: Covers your home or apartment against loss or damages. Identity Theft Insurance: This aids you in times of personal or commercial identity theft. Health Insurance: Covers basic and more extreme medical claims. Travel Insurance: Covers you from damages, losses, injuries, etc., when traveling. Dog Bite Insurance: Covers liabilities from your dog biting someone. Earthquake Insurance: Covers damages to your property from earthquakes. Terrorism Insurance: Covers you from damages due to acts of a terrorist. Ransom Insurance: This covers ransom payments to get a loved one released from a kidnapping. Personal Liability Insurance: Usually is designed to cover auto/home/renter’s-related lawsuits that are beyond the policy coverage, as well as libel/slander cases. Premarital/Non-marital Agreements: These help protect your assets when either your spouse divorces you (premarital) or a lover moves out of a cohabitation arrangement with you, and they seek various forms of asset claims. Here’s a look at the types of business insurance policies that are worth serious consideration. General Liability Insurance: Covers injuries, negligence, slander, or marketing violations. Professional Liability Insurance (Errors and Omissions): Similar to general liability insurance, this covers general liability as it pertains to a particular type of professional, such as a doctor. Workers’ Compensation Insurance: Covers the cost if an employee is injured while working. Property Insurance: Covers damages related to the commercial building you operate in. Product Liability Insurance: Covers damages that comes from defective products. Plant Insurance: Covers industrial equipment against loss or damage. Crime Insurance: Covers against damages as a result of crime and embezzlement. Specialty Coverages: Tailored policies designed to handle a specific business risk. In addition to the policies above, you could also take out a separate umbrella policy that would provide additional coverage beyond the particular policy limits for a category of risk. There’s a popular quote many insurance agents offer up to their prospective clients: “It’s better to be five years too early than five minutes too late.” This is especially true when it comes to protecting your small business.